Mustache #4 received the most votes with 37. However, mustache #4 was disqualified from the competition by the judges. Obvious and blatant infractions were identified when the votes were tallied. Mustache #4 was caught stuffing the ballot box in his favor. In fact, he enlisted a variety of people from all of the country who barely even knew him and were merely pawns in his plan to take over the mustache world. Mustache #3 was second in the voting with 29 votes. 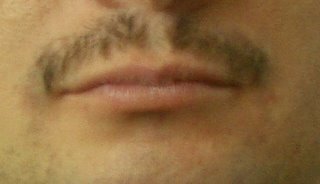 Unfortunately, Mustache #3 withdrew from the competition in a cloud of accusations and allegations, likely due to his thick, black, and luxurious ‘stache at the time of the competition. There were rumors circulating about the use of Rogaine (a substance banned by the Mustache Growers Association of America [MGAA]). Mustache #3 claimed he only used natural lubricants and softeners but refused to submit a hair sample for analysis. 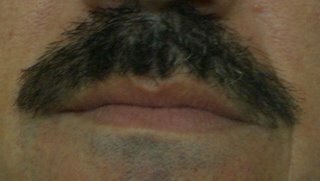 When the MGAA came to forcefully obtain a sample, Mustache #3 had been shaved off and the hairs scattered over the deserts of Iraq. Mustache #1 was a distant 3rd with 10 votes. 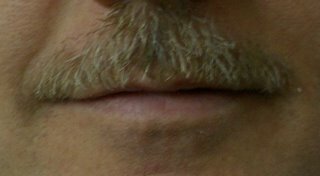 When the judges saw the excessive gray in Mustache #1 they determined it should have competed in an older age category (a much older age category), and Mustache #1 was likewise removed from competition. Despite only receiving 3 votes, Mustache #2 was declared the winner. Mustache #2 stayed within the MGAA guidelines, grew a natural mustache, competed in the appropriate category, and did not participate in nefarious voting strategies. Some of you asked what the prize is... the winner (as well as the three losers) will receive an all expenses paid trip from Iraq to the United States in March of 2007!! we're not going to have some kind of Florida-recount madness, are we? I must say though, this is proof that contrary to what Christian might say; I, Cynthia Clark, do not give him gray hairs. This is obvious from the fact that he has gotten quite a few extra grays of late. One might argue that they are due to the stressful nature of the job; however, I fail to see any grays on the other participants ‘staches. Thank you all for the many laughs that we all got from this blog entry. I am glad to see that you all have a sense of humor. I can't wait to see what is next. Keep up he good work guys. I have to admit I am glad #3 has already shaved his off. Are they all gone? Great job guys. i am concerned about the ethics of the moustache industry and yet encouraged by the winner's courage and resolve. I love you. X means we love you and x means that we want you to come back. You are my best daddy and I want you to hold me and carry me . If I pay you 2 dollars can you let me play playstation on Wednesday? how can you deny that request?